From Gnali & Zani: The basics in a stylish design: The Morosina Aluminum Stovetop Espresso Maker, 6 "sbarazzina" design porcelain cups and saucers and 2 "kicco" coffee spoons. The perfect set for 6! Beautifully gift boxed. Made in Italy. 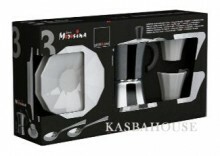 Click the button below to add the Morosina Gift Set Made in Italy 6 cup set to your wish list.